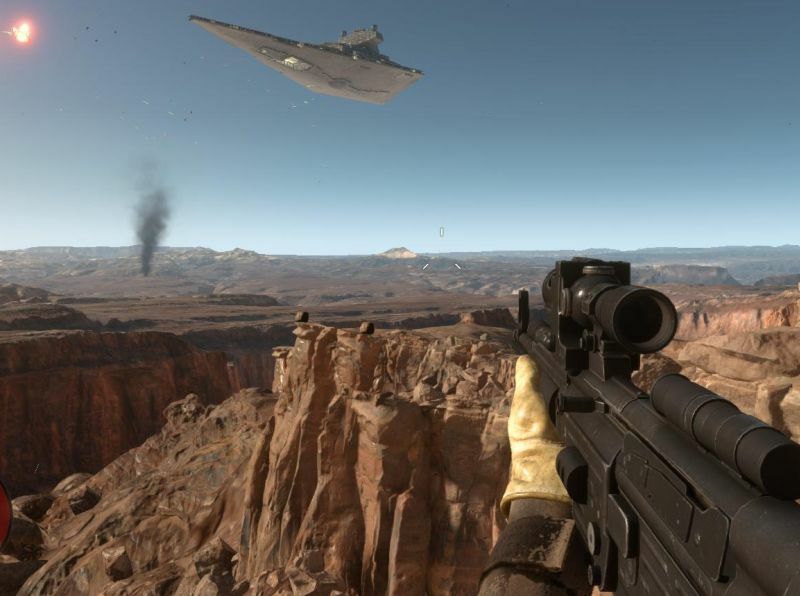 The new Star Wars Battlefront includes as many other Electronic Arts games a console where you can type in commands with useful functions. You can either type the commands into the Battlefront console, or you can store them in a configuration file for Battlefront to activate the functions permanently. With this article I will list some nifty console commands. In the first list you will find some console commands I wrote about. The second part is a complete list of all console commands in Battlefront. I hope you found what you searched. Check out all other Battlefront articles, feel free to drop a comment, or share the article if you liked it. No, sadly not. Not any of the listed comments has the function to disable the game music. I was curious and checked the audio settings in the game… never saw a game with so few audio settings, I hope they will include more options when the game is released, because that’s just not enough. How do I exit this thing? With the same key you opened the console, but it might be that you have to clear the things you typed in. I believe you can not close it if there is still something written in the text field. Could this be the problem in your case? I forgot how I opened it but I read this and figured out what ~ that is on Scandinavian keyboard. Has anyone tried the ‘Render.Dx12Enable’ command? It would be interesting to see if this offers a performance improvement over Dx11. I saw someone on Reddit with the same question and someone else said the command doesn’t do anything yet in the Battlefront beta. I can not test this, I use Windows 7. Do you know how to clear the text for the Console? I’ve tried a few simple commands but I don’t see the option. After using ‘list’ to show commands, it remains permanent and I can’t see the commands I am typing. No, I tried typical commands too, there is no command yet to clear the console, I missed that one too. I had the same problem, you can literally paint the screen with the command list lol. I guess they will fix this by the release of the game. For now you sadly can just restart the game to clear the console. Yeah the Render.DX12Enable doesn’t work at all. I’m surprised it’s there, because to switch render, I thought the game has to restart, and it wasn’t possible to switch it while running. I’ve tried It both in the CFG file and in normal commands. I haven’t however tried to disable DX11.1, which if is possible, the game could revert to the DX12 renderer? Just take “PerfOverlay.DrawGraph” for example… if enabled, it will show you a graph about CPU and GPU usage… if you want to show CPU usage only, you disable “PerfOverlay.DrawGpuGraph” first, it’s not that you just enable “PerfOverlay.DrawCpuGraph”. That is confusing at first, because one could think you just have to enable the CPU graph to show only this one, but that’s not how it works, you have to disable GPU graph to show CPU only. Considering this, I could imagine that’s how the DX commands might work too. I would just try to disable DX11 and see what happens, maybe the game will then switch to DX12. If that is not the case, you might just crash the game or maybe even the OS, then just kill the Battlefront process in Windows or restart the PC. Tried all combos, but it seems like it doesn’t work. Though, after adding it into the Config file, it results in an instant game crash due to the GPU device, for whatever reason. Probably hasn’t been implemented properly yet. In-game, it has no effect, it seems. Thanks for letting me know. Yea, seems so then, it’s just not implemented in this beta built I guess. I assume they will put an option in the graphic settings menu anyway after the release. Can U explain ALL COMMANDS? I just want the console window to go away and never show up again. Can’t even count the number of times that window coming up has killed me. They didn’t include the option to rebind the console key. I just setup a triple monitor system, do you know which of these commands will let me move the HUD to where it’s only on the center monitor? I’ve tried several without any success. You could tinker with the values to move HUD and minimap more to the center of the screen. I assume Battlefront has a “profsave_profile” file as well, I assume it’s in a location like “Documents\Battlefront\settings\” but I am not sure since I don’t own Battlefront (I wrote my articles when I tested the beta)… so, you might check for this file and the values I mentioned, if it’s the same as in BF4, you just need to tinker with the values 🙂 Of course, don’t forget to backup the file you want to change. I saw that solution on a BF4 forum and thought it would work too, but unfortunately is doesn’t. I searched the folder up and down for any profile configuration settings but they didn’t have one there either. If I figure out a way to get it done I’ll let you know. Okay, so the issue was that the game was displayed in boarderless window mode, l had it there for some reason because it initially helped me get the game displayed correctly because I had messed with my nvidia settings. To fix it, you just set it to fullscreen. Thank you very much, I am always glad if people report their solutions for their problems, because sometimes it happens that other people come here with the same question, and it might be that your solution will be of great help for someone else. Cool thing, thank you and enjoy the game! Hey Dennis your fix doesnt work for Battlefront, the options you specified are not in the ProfileOptions_profile file. He said too there is no “ProfileOptions_profile”. I can’t check as I don’t own the game, I wrote my console command guides during the beta, also I do not have 3 screens. And, no offense, but in case you comment again on any blog in the future, comments do often have a “reply” link that you can use to reply directly to another comment, and using it makes discussions more sorted (sub comments) 🙂 Just saying 🙂 I hope you have nice holidays, enjoy the time! Which one turns off bloom effects ? Since the commands are in Battlefront too, they should work. Enable or disable single ones and tweak the config to your liking. The “WorldRender.MotionBlurEnable” command will disable it if set to zero, but you might want to play with the other commands too, it’ll make the game look crisp, like the good old PC games. I don’t own Battlefront, I wrote the article during the beta, but if there is a motion blur slider in the graphics settings, you could also disable it ingame, but I am not sure if it’s there. If you still think it looks like a crossplatform game, I’d set postprocessing to low in-game, that’s what I always did in BF4, it’s a matter of taste, but I like it more then.